I first heard of Flames Of War in 2007 and immediately bought some ZIS-2 anti-tank guns, an Udarny Strelkovy boxed set, two platoons of Soviet Infantry, and ten T-34s. I made friends with someone who already knew how to play and had a vast holding of Flames Of War miniatures being a shark on eBay to pick up units on the cheap. We started meeting once a week to play and I kept losing to him. Every time I would learn something new and try it he would counter with a new German unit. I quickly learned the disparity between veteran German tanks and Soviet trained tanks limited by Hen-and-Chicks. I decided to build up the Soviet infantry with support units. About this time, my local game store owner told me about a school support program Battlefront had started and gave me the contact information with the Battlefront USA representative. I worked up the application and submitted it to the School Support representative at Battlefront (BF). He did some checking to make sure I was who I said I was to make sure I wasn’t out to get products for my own collection. 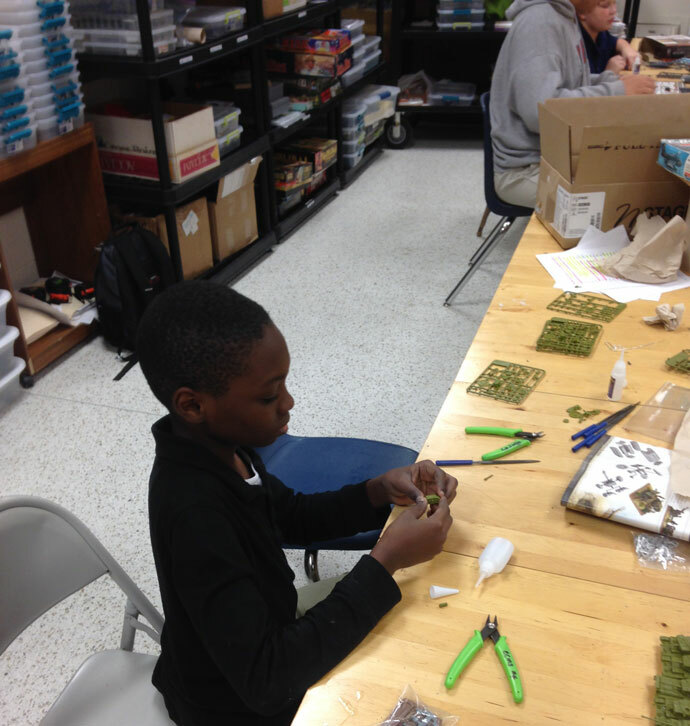 I received permission to start a Miniatures Club as an after school extra-curricular activity. I had fifty-nine students sign up! When I told my BF contact he was astounded that we could have that many interested. We received four 600-point starter armies’ units and got down to prepping and painting them. With sports season we began to lose some of the members and ended the year with around twenty students who had become hard-core members and attended most meetings. I found a way to raise money and used it to purchase more Flames Of War products. After two years, we moved into a new school building and I was given a classroom just for our Miniatures Club to use. Eleven years later and we are still going! Most of our veteran players have moved onto the High School with one who graduated this month. So next year we are seeking a new flock of recruits from redistricting and new sixth graders. 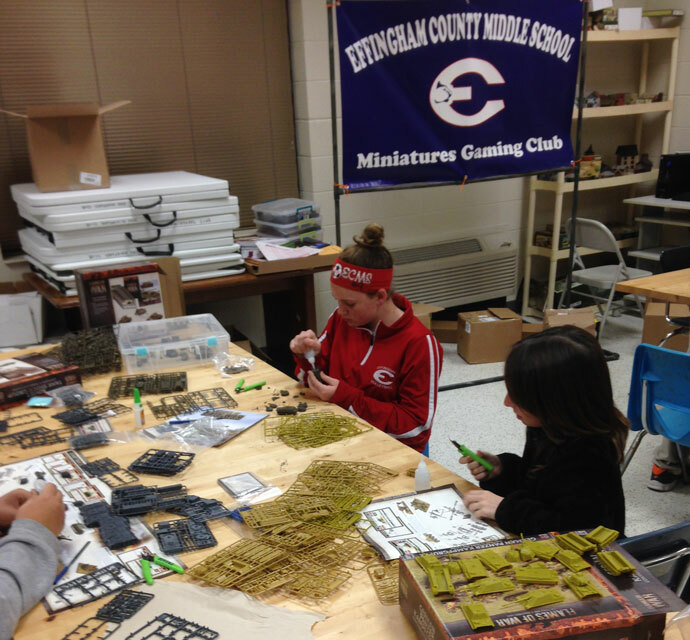 If you teach in America and have a love for this game I encourage you to also sponsor a Miniatures Club. Our school has a Literacy Block initiative in which students work on literacy skills for the first thirty-five minutes of class day. Around Thanksgiving, one of the staff came to me and asked if I would be willing to do a Miniatures focused class with a writing component for students who had significantly exceeded their reading score level after testing, provided someone was found to take over my literacy block class. The class would be part of “Genius Hour.” Of course I said yes! When students were allowed to choose where they wanted to go, the Miniatures class was the most sought class. I received 24 students. My Local Game Store (LGS) asked me to put on a tank demonstration and gave me a box of MW tank sprues. I had the students in my Genius Hour assemble the tanks. Other than having two tanks with the decks glued on backwards and one hull front go missing they accomplished the task. I then brought out infantry platoons and had students learn to push the figures around and fight each other to get the basics of the game. I did the same with tanks. 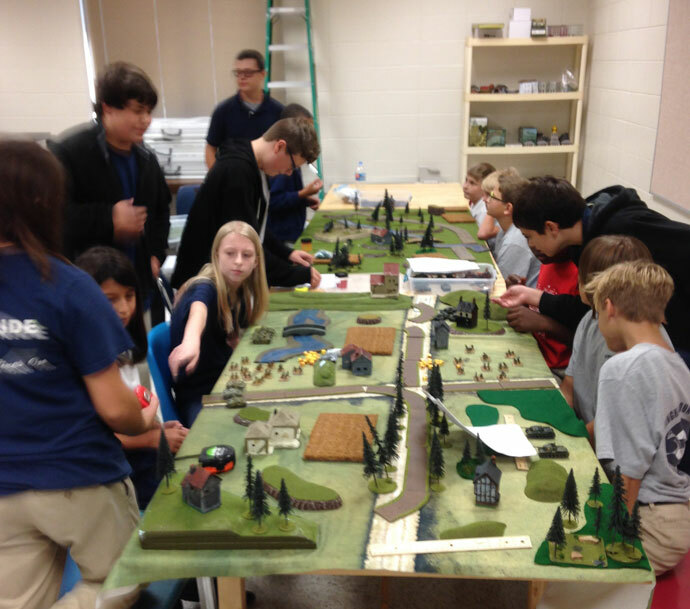 Then I set up two gaming tables and had students play complete battles adding in artillery, aircraft and support units. By the end of the school year over half the class were proficient in playing Flames Of War with me as a source to answer questions. The idea I had was to fight battles of the Battle of the Bulge but I found I did not have the requisite units. I am in the process of receiving a five thousand dollar award from a local company with the money used to purchase new units and supplies plus to expand into ‘Nam and Arab-Israeli Wars. I plan to purchase units needed to fill out the Battle of the Bulge US and German units and have next school year’s Genius Hour class begin by painting new units and then moving on to playing the game. 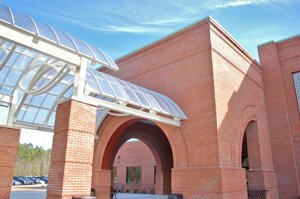 Students will have research and writing assignments to go along with the building of units related to The Battle of the Bulge. Miniatures is a classic game of strategy and game play. Miniatures can give you skills such as calculating the odds of a needed dice roll, measuring accurately, and good sportsmanship. Mr. Sheridan has helped us and gradually engulfed us into the game play. Now most of my friends and classmates [in our class] and myself are able to play on our own. Sometimes we may need a little assistance, but we rock! We learn about the weapons and their effectiveness towards the enemy. Other times Mr. Sheridan will tell stories about the major conflicts in World War II while illustrating it so simply. He doesn’t just tell us how to play, he shows us, and lets us try it. My experience in the Miniatures Hour has been amazing! I’ve learned a lot about Flames Of War and I want to continue playing. Dice seem to dislike me because I continue to roll low. Tanks tend to be the most effective units, IF you have the right ones. Out of all the scenarios I like Free for All the best because you strategically set up your units and charge the enemy. I also learned to make calculations to figure out what dice roll I need to make. Tanks are best dealt with by getting on the sides or rear to kill them. I hope to continue playing the game while getting better units and shortening the playing time. My miniatures experience was a long and fun one. We built tanks and played with the same tanks. We did several battles. We learned how to move [units] across the table. The game involves luck, with dice rolls, and skill, the way you move and shoot to destroy the enemy. The teacher allowed us to go against him with our group and we managed to beat him! My experience in this class was good. At first I did not understand the game. Since it has so many different things you have to understand. There are tons of rules and tactics to play this game. As well as learning a lot about this game I also met new people. In this class I was the only girl. So, at first, this class was intimidating due to me being the only girl and I felt awkward. I learned how to deal with these guys and developed new friendships. In this class I realized how this club is not just a club to some people but somewhere they can feel safe. It helped them solve some social problems. While in this class I learned a lot about armies than I have ever even thought about. I found out some tanks are better armored than others and in some cases shells cannot penetrate but bounce off. Overall this class was a winding road but by the end I found myself really enjoying it. From the mouth of students you can readily see they learned to play Flames of War while enjoying various aspects of the game and socializing. I am changing classrooms for next year so I am in the process of moving into my Miniatures Club room and moving the club across the hall into another classroom. I am a seventh grade social studies teacher at Effingham County Middle School. I retired from the Army where learned Russian and worked in Military Intelligence. I have about ten years left until full teacher’s retirement. I hope to continue to bring young men and women into the hobby.